The Phoenix metro area is the 6th largest city in the United States, and as the 11th fastest growing, that ranking will likely be rising. A desert metropolis in a mountainous basin; water scarcity, rising temperatures, and air quality are all concerns for current and future residents. However, some of our environmental impact reaches far beyond the city, and even the state’s borders. As extreme weather conditions increase, it’s time reevaluate our strategy and take action to ensure our city is livable well beyond our lives. In celebration of Earth Month, we’re breaking down what makes vibrant cities sustainable, and the kind of planning it takes to make it happen. The most walkable cities are the least car dependent, according to Walk Score. Automobiles are the largest contributors to greenhouse gas emissions and poor air quality in urban areas; building cities that don’t need them is key to increasing environmental friendliness. Walkable neighborhoods are dense, have mixed primary uses, are in close proximity to public transit, and have pedestrian and cyclist-friendly streets. In designing for walkability, planners must ensure diverse ground floor building activation, promote increased residential capacity, support complete street design, and prioritize shade infrastructure. Like walkable streets, designing cities around access to reliable public transit is a critical component of decreasing car dependency and increasing the sustainability of cities. By switching from a personal use vehicle to public transit for workday commutes, the average person saves 4,800 pounds of CO2 per year. In order for people to feel comfortable making that switch, transit must be frequent, reliable, and relatively pleasant to ride. Transportation planners can use data to plan routes that maximize use, but it’s up to city planners and economic development professionals to ensure high density developments are prioritized along existing and planned transit routes, particularly rail and street car. 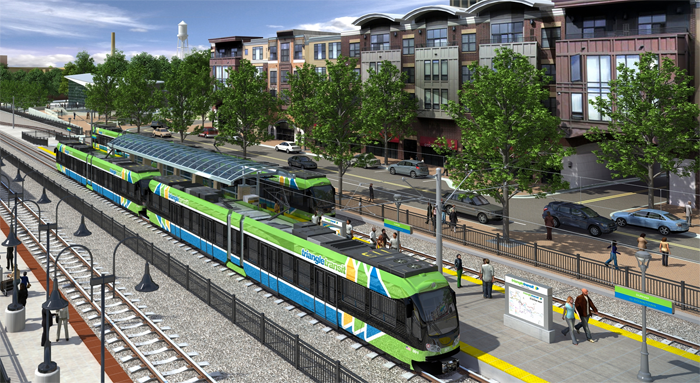 This type of growth is referred to as transit-oriented development, and is instrumental in the viability of public transit as an alternative to automobile use. When cities are successful in executing walkable, transit-oriented development that densifies cities, we’re able to preserve the beauty and wildlife of our undeveloped landscapes rather than sprawl into these spaces. This preservation conserves resources, maintains natural ecological systems, and reduces municipal infrastructure costs. Undisturbed desert landscapes are also more suited to temperature regulation and air pollutant control. Mountain preserves such as Dreamy Draw are amenities beyond public recreation: they’re critical to the long-term sustainability of our state. Cities are only sustainable if they are actively planned to be, and that has not been the case for the Phoenix Metro area, but we can continue to reorient our growth toward sustainability, equity, and community health. Join For(u)m and the Urban Phoenix Project for Jane’s Walk to start getting involved.